Front control decal design for 1986, 1987, 1988, 1989 and 1990. Evinrude/Johnson outboards 9.9 hp, 10 hp and 15 hp. 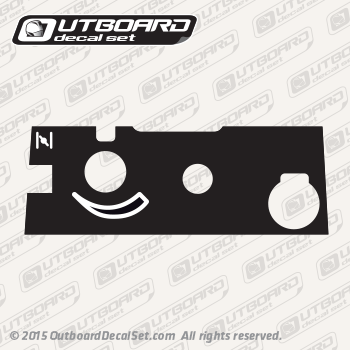 Purchase this decal sold by each to replace old decals on your outboard. Decals are made of outdoors resistant vinyl and are UV protected, perfect for outboards. 1974, 1975, 1976, 1977, 1978, 1979, 1980, 1981, 1982, 1983, 1984 and 1985, decal will fit also but is designed only for 1986-1990.